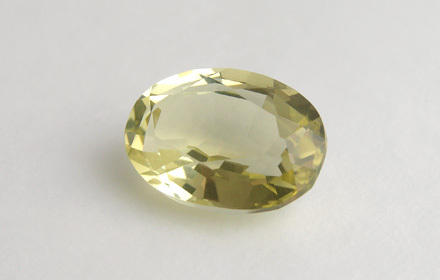 Weight: 4.96 ct; size: 13.40 | 9.47 | 6.23 mm; shape: oval; colour: light greenish yellow; strong; clarity: eye clean; cut: good; treatment: none. Probably irradiated rock crystal. Very clean specimen; good mixed cut style.